My sister just got back in town from Saba, which is a medical school in the Caribbean. Which means I would only see her twice a year, for her two week break. One in May, one at Christmas. She has just finally finished up the two year program and is home for good. Now she has to study for two months and take another test. The final of all finals as I understand it and then she will be placed at a hospital to do clinical. She wants to stay in Michigan, but I am not sure where she will be placed, and neither does she. When I was younger it was always us three, it is such a comfort feeling to have her back in my life. I have two older sisters who are twins, Katie is the one going to medical school and Jenni is going to Wayne State’s law school. They are a year and a half older then I am so we were all pretty close. It is funny how much more confident you become when you have someone who really loves you standing by your side. Together we are invincible, seriously though you don’t want to mess with the Gross girls. 😉 To this day they are the only people to love me no matter what. It doesn’t matter how much I piss off a sister, she will always stand up for me, or be there when I really need her. I am truly lucky to have such wonderful people in my life. 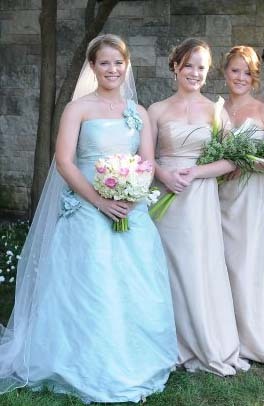 Posted by jaqviva on December 16, 2010 in Family and tagged climbing, Jackie, Jenni, Katie, sisters, Wedding.